3/4" ABS Bulkhead with 3/4" FPT (female NPT) (female pipe threads) on both the front and back of the bulkhead fitting (aka tank adapter). Comes with one gasket and one nut. 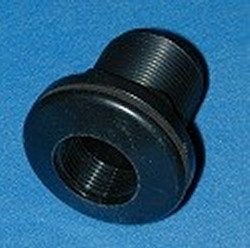 Extra nuts and gaskets available on the bulkhead fittings parts page. Hole size is 1.375" to about 1.5" Flange diameter is 2". Wall thickness is up to 1". Works great with our 3/4" MPT Drum Faucet. Made in the USA.